The Indiana Fever hosts Choices for Champions each year within the school year. The Indiana Fever bring in members from the Indianapolis community to speak to youth about the importance of education, living a healthy lifestyle and anti-bullying. Fever players also share their insight and experience encouraging students to make champion choices in their own lives. For more information on how your class can attend the next Choices for Champions event, please call 317-917-2500 and ask to speak to a Group Events Specialist or a member of the Indiana Fever Community Relations staff. The Read Like A Pro program promotes the value of reading and online literacy while encouraging families and adults to read regularly with young children. The goal of this initiative is to build a lifelong love of reading in young people by providing greater access to books and technology. 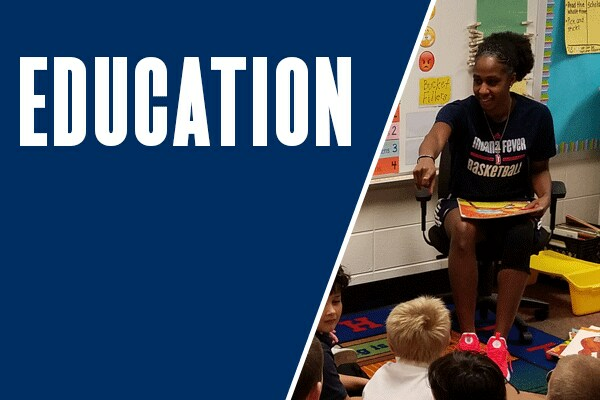 During the Fever season, the Indiana Fever hold Reading Time-Outs featuring special guest readers that include members of the Indiana Fever team and staff. These special guests read stories to youth in K-3rd grade from large oversized books. Each visit is approximately one hour in length. Youth participating in the Fever reading timeouts have the opportunity to win Fever prizes including books, autographed items, and game tickets! If you are interested in signing your school or summer program up for Read Like A Pro Reading Time-Out, please contact Roberta Courtright at rcourtright@feverbasketball.com. Click here for more information about Indiana Pacers Reading Time-Outs. The Indiana Fever team up with the Indianapolis Public Library to present Call-The-Fever as part of the Indianapolis Public Library’s Call-A-Story program. This annual program allows callers to listen to featured Fever players or coaches read a children’s story. Fans of all ages can call (317) 275-4444, to hear members of the Fever read pre-selected children’s stories. Phone lines are open 24 hours a day and may be accessed by up to four listeners at a time. Call-The-Fever was created to encourage school-age children to read and visit their neighborhood library. All stories run for one week during the month of August. Stay tuned for more stories in August of 2018. Natalie Achonwa reads, Big Hair, Don’t Care! Victoria Vivians reads, I Am Enough. Stephanie Mavunga reads, You’re Here for a Reason. Erica McCall reads, I Got The Rhythm. Kayla Alexander reads, Be Who You Are.